NORTH Melbourne AFL Women's recruit Jess Duffin has capped off an excellent state league season, winning the Lambert-Pearce Medal as the VFL Women's best and fairest and being named captain of the team of the year. 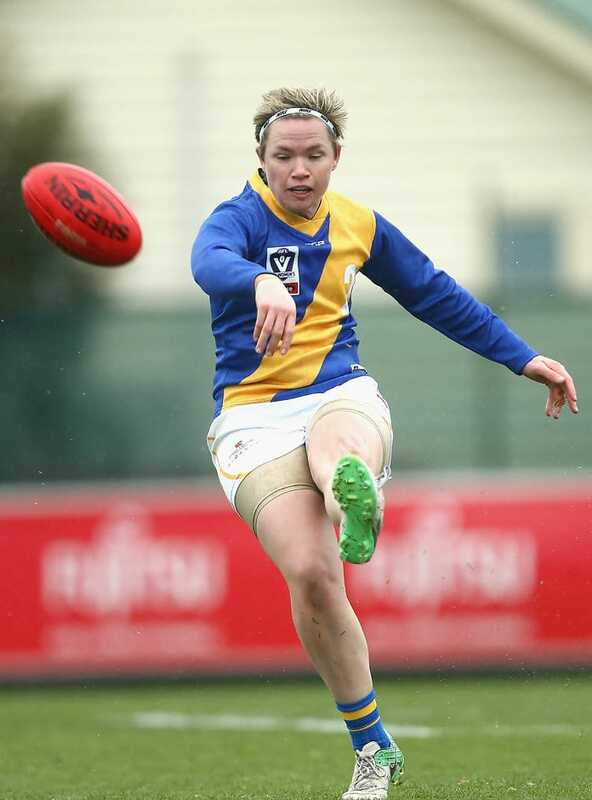 Duffin, playing her VFLW footy for Williamstown, had the vote count won in the second-last round, finishing with 23 votes ahead of Darebin ruck Lauren Pearce on 17 and NT Thunder defender Angela Foley on 16. The duo play for Melbourne and Adelaide respectively in the AFLW competition. Duffin has spent the past two AFLW seasons at Collingwood, but made the move to the Kangaroos in May. She started playing at Williamstown in the interim and stayed there for the whole season. Hawthorn VFLW captain Emma Mackie (who plays for Western Bulldogs in the AFLW) and Carlton star Darcy Vescio rounded out the top five with 15 votes apiece. Vescio also won the leading goalkicker award with 26 goals, with Darebin's Hannah Mouncey in second with 19. Duffin, 29, had the highest total disposals in the League and averaged 25 touches in her 13 games. Normally a forward at AFLW level, Duffin split her time between the middle and inside 50 for the Seagulls. She was also ranked first for average uncontested possessions (12), marks (5.5) and rebound 50s (four), as well as third for contested possessions (13) and inside-50s. Pearce has taken her game to a new level this season, using her 184cm height to her full advantage in the ruck, as well as being an important mark at either end of the ground. The 25-year-old's second placing is the more impressive when the fact she played just 11 of 16 games is taken into account. She averaged 25 hit-outs from her 11 games, along with 17 disposals and five marks. Foley was a pacesetter in the Thunder's first year in the competition, captaining the club and rotating between the midfield and defence. She ranked second in the League for inside-50s and first in her club for disposals (averaging 22) over her 12 games. Hawthorn's Jayde Van Dyk was awarded the Debbie Lee medal for the Rising Star, while Collingwood's Penny Cula-Reid was named coach of the year after the team won the minor premiership.